We have a house we are selling. Our next step is to move all our stuff and us over TO the land and build our home. Although we love to camp, and in recent history here in Texas, we could lay out all of our stuff in the naked meadow after June 1st without fear of a raindrop touching it before October, some sort of shelter seems prudent. Unless you have found a place with a home already on it (my last two homesteads have been one of these), or have a lot of money lying idle and can afford to build your new house while living in your old house (I’ve heard some people can actually do this, although no one in my social circle can claim such high finance), you’ll be faced with the dilemma of where to live in the “between time”. Mainstream Americans put most of their stuff in storage and either rent a place for the 6-8 months it takes for their builder to put up their house, or buy a little mobile home and set it out yonder while the builder does his thing then have it hauled off when they are done. A few daring folks will live in a camper, and a few will move in with relatives. We really want to maintain good relations with our relations. This requires a respectful distance at all times. And our plans are to build our permanent house. Not “hire a builder, choose a plan and pick out colors and faucets” kind of building. More of a “design it out on graph paper, accumulate the supplies, learn and assemble as we go” sort of building. So our timeline is a little different. My conservative estimate is five years from start to finish, paying as we go. Granted, life may get in the way of this plan and cause it to be amended, but that’s the plan today, and we’re sticking to it. After hearing “So what’re ya’ll gonna do? Live in a tent?” for the thousandth time from friends and acquaintances, Ward looked at me and said, “You know, I’ve always thought yurts were neat”. Yurts are the traditional homes of nomadic tribes who make their livelihood following their flocks across a forbidding landscape. 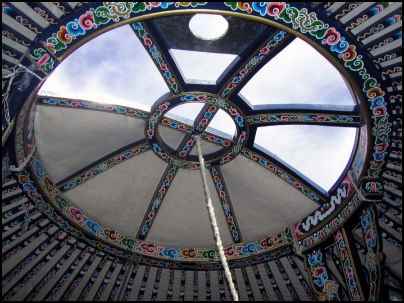 A yurt is designed to be a permanent, movable home, which only sounds contradictory. The original yurts (Mongolian Gers) are assembled from local materials (saplings, cotton cloth and lots and lots of felted wool) and have been fine-tuned over the last 3,000 years or so to be cool in the hot summer sun, warm in the frigid winters, as well as stay upright and strong through the flat line winds coming from the steppes. Here in the US, yurts have been adjusted, updated and built large scale by three companies: Pacific Yurts, Ranier, and Colorado Yurts. All three come recommended by actual American yurt-dwellers as having quality products and very good, to excellent, customer service. After looking at all three sites, and using the handy (and fun) price quote estimators, I called both Ranier and Pacific, whose friendly sales staff sent out informative packets. The packet from Pacific was more in-depth and flashy, so being a creature drawn to such things, and the fact that their yurts priced out as less expensive, I’ve been working with and talking to Scott at Pacific to get the Yurt of Our Dreams. The yurts built by one of the above companies are sleek, clean-lined, and beautiful in simplicity—unlikely, yet wonderful, crosses of “Girl Scout Sleepover Camp Platform Tent” and “Yuppie Renovated Warehouse on the River Loft”. They use state of the art materials to ensure a non-leaking, comfortable, very livable space that is as strong as something made mainly of cloth can be. I was happy. I had a plan. I knew what I was doing. Then my friend Dawn skipped in and ruined it all. It came as an innocent looking email titled, “Look at THESE”. And my world tilted flat off of its orbit. Gers. Authentic Mongolian Gers made by Authentic Mongolians. And importable to the US. Where the U.S. Yurt is sleek, a Mongolian Ger is touchable—like a teddy bear. They are decorated outside by embroidery around the doorway and inside by each…and… every… rafter being painted with elaborate designs and set off by carvings which match the carvings on the door and toono (circular opening at the top of the roof). The wood is painted in bright colors, which is appealing to me. The outer cloth, inner cloth and felting are really cloth and felt, which is appealing to me. 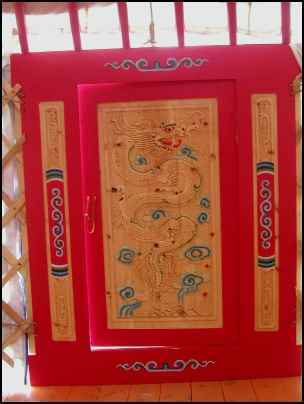 The fact that the Mongolian Ger—made and painted to order in the same way they’ve been made for thousands of years is CHEAPER even shipped from the other side of the planet than the ones made in a factory in Oregon is WILDLY appealing to me. So I contacted three companies selling “Authentic Mongolian Ger” and got a response from one of them. Heloise Rey is very helpful and patient, sending a lot of pictures and answering all my questions to the best of her abilities. I also joined a Yahoo group, and was instantly embroiled in the (previously unknown to me) vicious war between ‘”Traditional” and “modern” yurt/ger owners. Traditional ger enthusiasts say that the U.S. made yurts are flimsy, plastic mutations of a time tested and loved building form. They say if a yurt is not surrounded by felt, it’s not a yurt—it’s a tent. And there’s nothing wrong with a tent—just don’t call it a yurt. 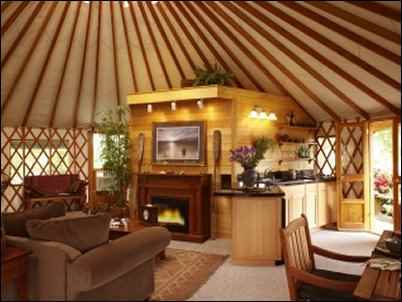 They say that if a yurt is built with solid walls and windows, it’s not a yurt—it’s a round house. And there’s nothing wrong with a round house—just don’t call it a yurt. A traditional ger’s lattice is it’s bones, and the felt is it’s muscle— stabilizing and holding the ger intact in wind storms so they don’t need “snow and wind kit” add-ons like the modern ones. A traditional ger stands on the ground—solid earth beneath it (covered with rugs), natural wood and wool on the sides and the sky open through the toono. One door. No windows (although the Mongolian companies will add them to appeal to the American market). Traditionally, air is circulated by simply rolling up part of the side, causing the cooler air on the ground to ooze in and rise up and out the toono as it gets warmer. The door is solid wood, sometimes bracketed by narrow windows; decoration and carvings showing the status of its occupants. Inside, the placement of furniture and living areas are strictly adhered to from ger to ger. This ger is made to be taken down in a few hours’ time, strapped to the back of a yak, and re-built in the same amount of time at the new grazing grounds. 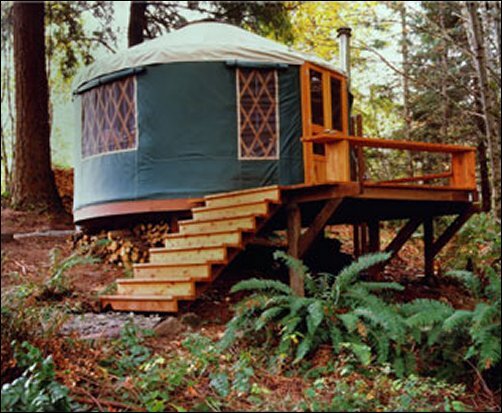 Modern yurt enthusiasts say that the traditional gers are poorly made imports and fall apart in our climate. They say that the felt gets moldy and attracts bugs and mice. They extol the strength of their airline cable tie-downs, beauty of having windows all around, ease of care of the waterproof poly/vinyl exterior, and snug their yurts down on wooden platforms that are everything from a deck a foot above ground, to way high up in a tree—but they MUST be placed on a deck. They can be simple one-room shelters or homes with electric/plumbing, partition walls and (in the bigger ones) loft living areas. With the wind and snow kits attached, they are as stable in high winds as a lot of brand new mobile homes (rated for up to 90mph). The modern yurt can be taken down at the end of summer/hunting season in a few hours time, strapped to the luggage rack of your minivan, and stored in the garage till next year OR lived in full time—in my cyber-wanderings, the longest yurt dweller I’ve come across has been living in her Pacific yurt with her family in Minnesota quite comfortably for seven years. In the US made yurts, insulation is provided by a “reflective medium” that looks like bubble wrap coated with tin foil. Although the manufacturers claim that it works by reflecting the heat OUT in the summer and IN in the winter, the real life yurt dwellers have given mixed reviews. I’ve looked at alternatives to the bubble-stuff, from natural fiber insulation sheets made of recycled cotton/denim to recycled plastic heat-bonded to Styrofoam on rolls, and heard of folks using everything from straw stuffed in-between layers to garage sale blankets sewn to the sides. With my eyes and brain slightly crossed, I’ve attempted to figure out not what’s “right”, but what’s right for my family in my climate and in my circumstances. To their credit, not a single resource person on either side of the Yurt Debate has been outright demeaning to the other side. They just think their side is better, and have told me why, calmly and rationally. It’s been great fun and wonderfully educational to talk to people from Oregon to Mongolia to New York City to Holland to Spain, and I’ll happily share what I’ve found out. Although Mongolia can get very hot, very cold and very windy, it’s very dry (it’s in the Gobi desert—guess I slept through that class…), and the materials used to make the traditional gers are not grown, or made in, or made FOR a damp environment. The other side of the planet is very far away, and your average Mongolian cannot comprehend the humidity of East Texas, just as I did not realize that Mongolia was arid. As mentioned before, Heloise in Mongolia did answer my questions, but admitted while doing so that these answers were to the best of HER knowledge, not necessarily what WOULD happen when the ger was assembled and exposed to this climate. What I’ve gathered is that when the imported ger meets the southern American humidity, the glue has issues, the paint has issues, the felt has issues, and the material has issues. This does not mean they are cheap imports, it means they are built for, and in, a different environment. 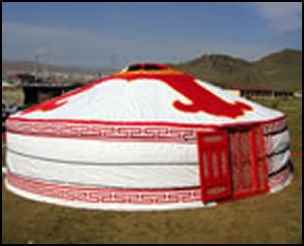 Now, there are people in Europe (and if you join the yurt Yahoo group, you will meet them), who are making “traditional Mongolian ger” using the measurements and structure of Mongolian gers but with materials that will hold up to a more humid environment. But again, there’s still a big ol’ pond between Europe and here, and the gentleman I talked to in Holland (Froit—nice man, very helpful and patient) couldn’t comprehend WHY I need my ger to be tight sealed on the bottom. I don’t mind it being on the ground, but crawlie things shouldn’t be able to get in. He suggested we get a cat. Apparently, things like poisonous spiders, scorpions, and snakes (not to mention skeeters as big as a fry pan) are not a problem in Holland. He also stressed that a ger needs to (as in MUST) be moved at least every six months for its health. And the wait time on one of these “improved traditional European gers” is right at or just over six months. IF we were not needing this structure to sit securely in place for at least five years, and IF we didn’t have health and comfort requirements to consider, we’d happily wait for a traditional ger. In fact, at some point in the future, I’d love to get a small one to be a little retreat we would move around from one favorite spot to another—from the top of the hill, to the creek bank, to the back high corner overlooking the marsh, etc. depending on the season. But that’s not what we need right now. Which brings us right back into the lap of Scott at Pacific Yurts, who did not hold my brief fling with the Mongolian ger against me. In fact, he helpfully admitted that if we wanted to stencil decorations over the doors/windows, we could use latex house paint without compromising the integrity of the waterproofing. And that the wooden parts come oiled, not varnished, and would hold any oil-based decorative painted designs we might want to add to them. Now if I could only get him to carve a dragon into the front door….